I, TORA, or with the name my family had presented to me: Ozlen Tuncer; was born in Izmir of Turkey. I have had may education in the best schools of Turkey; primarily in Bornova Anadolu Lisesi and then Middle East Technical University. I have been graduated from Middle East Technical University, Faculty of Architecture, Department of Industrial Design. During my university years I used to earn my living from the stage. It was November 1982 when I got on the stage first. In 1989, during my senior year at the university, I had founded METU Magic Club. In addition to this and as a support to it, I had also founded METU Magic School. With this little step, I become the first a magician who had instructed magic at a university in Turkey. Nevertheless, neither the Club nor the School could survived after my graduation. Magic is not a hobby, is not a profession for me... It is a passion by birth. I was born as a magician. Magic is my life style. Although I had considerable success in Industrial Design also, people did not accepted me as an “Industrial Designer doing magic” but “A Magician who also makes designs.”. I run my own company OBA Design & Organisation Ltd. Co. I have attended to many television shows and finally I had my own TV Program named as “Telegiz” (meaning Tele-mystery). And then I moved to another documentary program showing the mystical and mysterious places of Turkey named as “Telegezi” (meaning Tele-Travel). I have won awards with my TV programs. I had also had columns in the Yeni Asir Daily for 6,5 years. I have also been awarded with some awards for my columns and special news. I have given a break for my media works by the beginning of 2001. I have a dream: “One day I dream about founding a “Department of Magic” in a university. I will do my best in order to achieve this. 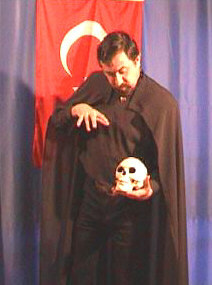 Another point is that I am the first mentalist of my country who represented Turkey in an International Contest. In fact I was chosen to do that by the Turkish Magicians. They wanted me to be an International Mentalist representing my country. I am currently doing that. Nevertheless, I also do Cabaret Magic. I consider myself as a “Magic Entertainer.” I like to entertain people more than to baffle them. People deserve to be entertained. And I will do it for them. One point more, thanks to the schools I have gone, I am bilingual : Turkish- English. I also speak some French also. There are many people who had contribution on me but I have to thank one person especially: Dr. Morgan, my mentor. He did not teach me lots of tricks. He taught me how to become an original not a copy of anybody on stage. He also taught me the ethics of the art. He is a great man. He had created a “TORA: The Prince of Magic” from a “Ozlen the Magician” in a short time. I should also thank to my mother Turkan who helped, with my stage props and costumes being a good tailor. My dad is an awesome tailor, the best I have ever seen. They helped me out for my costumes to be the tiniest problem in my stage works. My Aims: are so many I am afraid if I can not do them throughout my lifetime, may be my time will not be enough. My Successes: I am not sure if I had succeed in something, yet. My Targets: I want to be remembered as a “first class artist” I want to be included in a book even with a single line. By this way to reach the next generations. If you have visited this page that means we have something to share. I hope you will not get bored while you surf through my web site. Please do not hesitate to pass your comments about anything. I really need them. Thanks a lot for visiting my site... With my magical greetings.